Travelling on a bus filled to the brim with people 30 (or 40) years your senior can be a surreal experience. The generational gap is bigger than one could expect but as the days pass, you start to bond over the simplest of things. Pun-based jokes, the great writers of English Literature (Brönte sisters, of course), lucky pennies and ales. Slowly but surely, you find that although these persons are old enough to be your grandparents (or parents), there are things in common. They might even pull a quick one on you as their gadgets (and their understanding of them) turns out to be superior to yours. It’s a weird line of thought and an even weirder experience, to travel in coach around the UK with people you might believe don’t have anything in common with you, but old and new aren’t as far as they seem. See also: The Whiskey Priest‘s Lost Wages. A sweet, sweet album of seven songs. They sound like the songs of old that the people in this bus would’ve been listening when they were nippers, but the emotions displayed are as timeless as the Sun. Seth Woods is a true renaissance man. This project might be quite different from Sad Accordions (a superb band on their own field – review) and even if nostalgia and yearning are the emotions you get from both bands, the method of delivery is so different. Whereas Sad Accordions goes for the rock/blues method, The Whiskey Priest varies. Sure, acoustic guitar might be the unifying sound in Lost Wages, but the little snippets of droning, the electronic drumbeats and the actual organic sounds of the recording (someone mutters the name of the album, a pedal switch goes off in another song) makes it such an intimate affair. Lost Wages feels so close to the bone. Two instrumental songs feel like very old memories surfacing. The chilling ‘Lost wages’ starts the album sounding like an old gramophone found amidst a Blitz era demolished building; the sadness around the devastation expressed perfectly on the sad chords chosen by Seth Woods. The other instrumental, ‘The Borderlands at night’ goes into Post Rock territory. It’s the juxtaposition of acoustic loveliness with the electronic notes full of yearning that make it such a gem with that expansive sound. It actually makes me think of those hot summer sunsets back in Tampico, when you could still be by yourself and safe. Long gone days. ‘Watch me tesseract’ and ‘Wave and cloud no. 2’ are a wonderful pairing. The former is a sweet ballad, with several layers that never grow into a cacophony, just feel like the different shades a painter like J.M.W. Turner would use to describe a sky. ‘Wave and cloud no. 2’ on the other hand is almost minimalistic and filled to the brim with yearning (not unlike the album’s closer, ‘The Wages of Sin’). There’s two songs that I saved for last in this review. First it’s ‘The Sparrow’, an 8 minute juggernaut that mixes alt-country, electronica and drone. It sounds like chalk and cheese but it’s more like peas and carrots. It works, it has a story to say and it delivers. ‘The ballad of the Whiskey Priest’ is shorter, but possibly as epic (yes) as ‘The Sparrow’. It’s hard to put on words the emotions you get (all about Mr. Woods’ voice – it’s perfect) but it’s a wonderful song for this Autumn season. 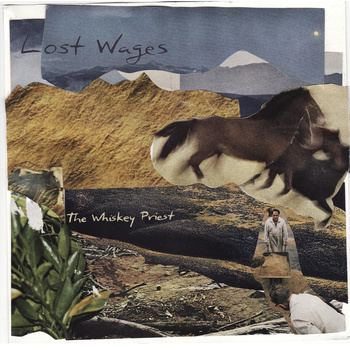 The Whiskey Priest Bandcamp. Facebook. Twitter. Posted in Alt country, Americana, Experimental, reviewsTagged Lost Wages, Rainboot label, the Whiskey PriestBookmark the permalink.